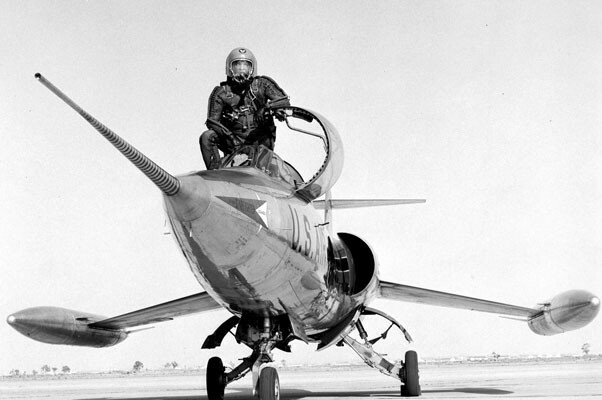 Front view of XF-104 with Lockheed test pilot Tony LeVier. Being a lifelong resident of the Antelope Valley and growing up around the greats that pioneered advancement’s in aviation in the High Desert skies I look forward to giving you stories in each issue that may not make the rounds that much anymore in the current world of our local aviation history. Many of you know me and see me around the Valley from time to time and if you would like to see a topic that you have an interest in feel free to contact me and we will see what we can do to share those stories! So now on to a story about a famous test pilot who had the right stuff but then on one day over the skies of Lancaster that right stuff was blessed with a little bit of good luck! Tony LeVier needs no introduction when it comes to savvy people who follow aviation history. Tony was one of the best to ever fly rivets and sheets of aluminum into the unknown that engineers on the ground would draw up in the form of an airplane. In the war years of World War Two Tony found himself involved with the flight testing and development of the famous Lockheed P-38 Lightning. The Lightning coming off the drawing boards of the late 1930s and was an airplane that was leaps and bounds ahead in technology and the design crews, engineers and pilots had to play catch up when trying to understand why this sleek bird was such a handful to fly. With Lightning’s gaining a reputation as a pilot killer the Army Air Corps was looking for a little help to bring some reassurance to the new shave tail air corps pilots that the P-38 was a sound design and when in the hands of a competent well trained flyer could just about fly the pants off of anything else in the world! Many of you may not know that in World War II at the corner of current day 60th Street West and Avenue I in Lancaster was an Army Air Corps training base called War Eagle Field that was the home or the Polaris Flight Academy where hundreds of student pilots were learning the basics of combat flying. On one particular day Tony, War Eagle Field and hundreds of students almost ended up with dark cloud over the field if not for a little bit of luck with a bumper crop of skill from Tony. I will let Tony tell the story in his own words. “Up in the High Desert, in the vicinity of Lancaster and Palmdale, I set up a small program in the P-38 to acquaint myself with low level aileron rolls, single engine maneuvers and upside down flying. 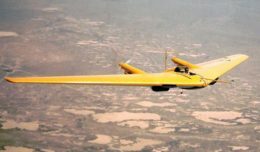 “I began by rolling it upside down at a safe altitude around five hundred feet and flying it inverted until I learned how to hold it in level flight in that position without losing altitude. Then I repeated this maneuver closer to the ground, finally doing it at 50 of 70 feet. “When I had mastered inverted flying with two engines I turned one off and repeated the maneuver on a single engine .Pretty soon I was able to do my stunts practically on the deck. After I became fairly proficient I would sometimes conduct my practice in the vicinity of Polaris Flight School at War Eagle Field where two of my old students were now flight instructors and upon seeing what I was doing sent out an invitation to have me fly for the cadets at the field. “With approval from Milo Burcham and Lockheed with the blessings from the Army Air Corps I was on my way to Lancaster for the first P-38 demonstration the likes that cadets had never seen! “My job was to sell the P-38 to the pilots and to encourage them to request assignment to P-38 training which was difficult because it was a big airplane and had two engines and I wanted to show the class at Polaris that despite its size and high performance it was extremely easy to fly. The demonstration almost ended up a disaster had it not been for my good luck and the fact that the p-38 was a fine airplane. It had a reputation among many pilots for being treacherous on one engine in a stall and when the students asked me to demonstrate a stall on one engine I agreed because it was a chance to prove this report was untrue. I had stalled the airplane a number of times on one engine and never noticed how much altitude I had lost before I regained flying speed if I stalled this time at 1,000 feet I assumed that I would have ample altitude to recover. Tony being nothing but professional upon arrival back at the field did not take what happened lightly and in fact came clean with all those in attendance stating that he had made a mistake and stalled to low! Tony learned from all these experiences and they made him the great man that he was to be and his gifts of aeronautical understanding benefit us even today as man is always looking to push the envelope forward in his quest for safety, performance and engineering excellence and we here in the Antelope Valley are glad that on a day at a Lancaster Airfield this didn’t come to an abrupt ending and that Tony LeVier would fly on for many more years into Aviation history!